Stephen Fung's Tai Chi 0 proved to be a bit of oddball fun. The martial arts comedy mixed in some aspects of steam punk that took what could have been a run of the mill actioner into a bit of a spectacle and even though some of the comedy didn't really work, I expect some of the jokes that didn't fly so well failed due to differing cultures, it still managed to deliver a good bit of entertainment. 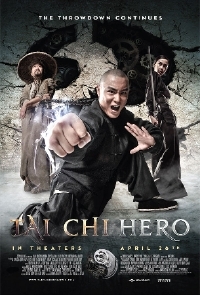 Tai Chi Hero, the second entry into the trilogy, picks up were the first movie left off and worry not, if you haven't seen the first the first few minutes do a good job of catching you up on the story to date. Lu Chan has been accepted into the village but in order to be taught the Chen style of fighting, he must be Chen. The village elders devise a plan to marry Chan to Yuniang, one of the elder's daughters and by taking her name, they're able to instruct the young man in the style which will not only help him control his odd power but will make him the most accomplished fighter the world has ever seen. Things go sour when Yuniang's exiled brother returns to the village. The young man was always more interested in creating things than in learning kung fu but he returns now a man and with a warning to the villagers that if they train Chan, they will bring destruction to the village. What no one realizes until it's too late is that he's also come to take over the village as a way to repay debts to some very nasty people including a representative of the East India Company who is determined to build a railroad right through the village. One of the major faults with Tai Chi 0 was that it came to a screeching halt whenever a bit of story needed to be flushed out. Tai Chi Hero mostly manages to avoid this problem, incorporating more back stories and historical references without losing steam and when it does start to lose energy, it very quickly recovers. Once again director Stephen Fung doles out some crazy action sequences, be it hugely entertaining wire work like that on display during the kitchen fight sequence which is wonderfully intercut with food preparation or the appearance of the flying machine which saves our leads. I love the ridiculous action sequences, the video game aesthetic of Chan's quest was particularly entertaining, and the out of left field musical choices which include everything from classic movie tunes to Swedish death metal, but Tai Chi Hero also delivers a feel-good story of redemption and working hard to better yourself. It's a surprising but welcome treat to walk away from an apparently mindless bit of entertainment with a good message. One thing that I'm a bit miffed about is the lack of Peter Stormare. It's certainly understandable why he's featured so heavily in the North American trailer for the movie while only making the smallest of appearances but he's so good. The bad accent is perfect and he seems to be having a heck of a good time playing the evil mastermind though worry not, considering how the movie ends we're likely to see Stormare make a return appearance in the third instalment. It may have started off lukewarm but this franchise has definitely picked up speed with Tai Chi Hero. I'm not sure how Fung and writer Kuo-fu Chen are planning on attacking Chen village next but I'd definitely interested to see how it ends. Tai Chi Hero opens April 26th.